I've taken a long break since my days at FPG News but I'm back with some reviews incoming and for the time being I'll be looking into my favourite genre: horror. With the recent release of Annabelle: Creation , which I've yet to see, I thought I'd take a look into this now acclaimed franchise, starting from the very first one released in 2013. The Conjuring starts Patrick Wilson and Vera Farmiga as Ed and Lorraine Warren who are demonologists that investigate residential hauntings to help those troubled by the supernatural. These are characters based on the real life investigators of the same name. In this film they seek to help The Perron family who have moved into a new house when things begin to go bump in the night and it only gets worse from here. I have to say that I do love the first five minutes of the movie as it introduces us to the characters of Ed and Lorraine with them working on a recent case. 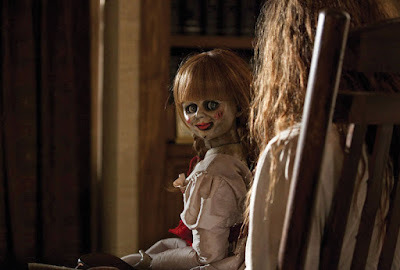 And this case just happens to involve a possessed doll known as Annabelle. It's a very impactful scene as it sets the tone for the rest of the movie while also giving us one of the scariest moments in the film with Annabelle haunting the residents of the apartment. 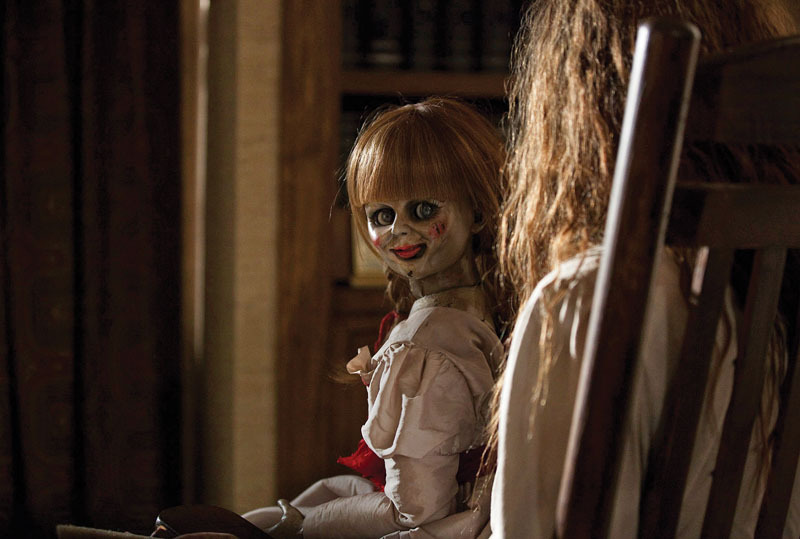 It was so good that it led to Annabelle getting two feature films of her own, the first of which I may look into next. Thankfully these opening moments wouldn't be the last we would see of her. So I will admit that the story can be slightly cliche as it begins as you have all the classic signs of a haunted house movie and it does feel a bit like The Amityville Horror in the early stages. It doesn't help that we have the usual story point of the youngest member of the family acting like the evil spirit is an imaginary friend which seems to happen in these movies way too much. As a tip, if you move into a place that doesn't feel quite right and then your dog mysteriously dies, you may want to rethink unpacking those boxes. These are only minor quibbles though as the movie ramps up the tension from the get go and never releases you. I've got to be honest when I say that this is one of the scariest movies I've ever seen and I've never had a feeling of dread quite like it while watching. Thankfully it drops more modern horror movie tropes of cheap, loud jumpscares by actually scaring the hell out of you with long, quiet scenes, just knowing that something bad is about to happen. Finger nails will be bitten I can assure you. It does use loud noises to bring across some frightening moments but these are used sparingly and only when you're supposed to be scared. The soundtrack helps with this as well as composer Joseph Bishara did an excellent job, and even sitting here listening to it on Spotify is quite the eerie experience. The acting performances should be commended too as Wilson and Farmiga shine as the demonologists and Lili Taylor may have been the standout as the Perron family mother, Carolyn, as she did have what must have been the most difficult performance. With these movies sometimes the child actors can be the death of the film but all the girls here were excellent as you could really feel their fear during some intense scenes. I don't want to go into too much detail on the scares as there are many and I wouldn't want to spoil it for anyone who hasn't yet watched it. One scene that does stand out though is the one featured in the trailer with Carolyn investigating noises from the cellar. I won't go into too much detail but it may be the freakiest scene in the entire film and almost guaranteed to have you losing a good night's sleep. James Wan is the director on hand and he once again shows his penchant for horror as his work is just masterful. From the timing of the scares to pin point camera angles, everything just worked here. He knows how to get inside his audience's head and he knows how to frighten once he's in there. The movie is 111 minutes long and somehow it doesn't let up for a single second as there's a feeling of dread no matter what's happening on screen. It feels like there's something watching every movement, waiting to strike at the right time and god is it unnerving. The finale also gave a satisfying ending after so much buildup and once again the tension was just through the roof. If you haven't seen this one I'd highly recommend it as it is one of my favourite horror movies and a guaranteed fright fest for anyone that hasn't seen it before. Just make sure you don't watch it alone.